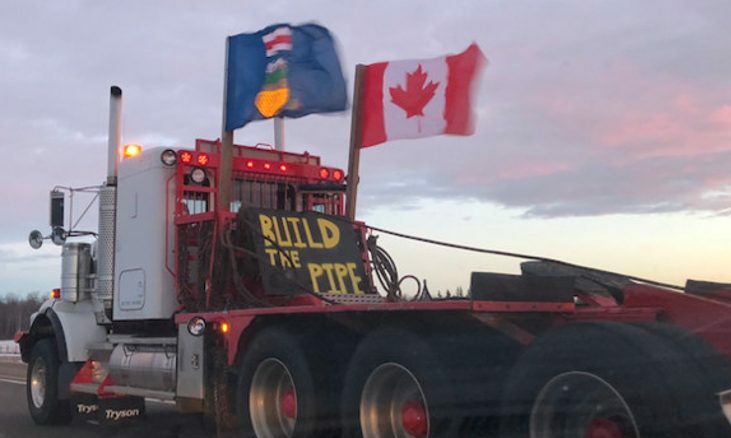 Currently, pro-pipeline reactionaries are planning a truck convoy from Alberta to Ottawa. This intended show of force is meant to pressure the federal government into taking more forceful actions to get major new oil and gas pipelines built. At a time when Indigenous peoples are heroically resisting massive industrialization in the Pacific Northwest, we must fight back against this foray of far-right forces into pro-pipeline activism before it becomes a real threat. We call for mass actions in support of Indigenous sovereignty to be organized in Ottawa and in all the cities along the planned route of the truck convoy, from February 14 to 19. While it may turn out that moving hundreds of oil trucks across the continent will be too tricky and expensive for these inexperienced organizers to pull off, we believe it is important that such an initiative does not go unopposed. We call for a counter show of force by all anti-colonialists and anti-fascists to push back this movement for further theft and destruction of Indigenous peoples’ territories, and to maintain the mobilization in support of the Wet’suwet’en people who are currently fighting a vital battle against Canadian armed forces and an energy company to preserve their territory. The truck convoy, which was originally conceived by industry-sponsored institutes, was quickly taken over by far-right organizers, who intend to use this convoy to advance an agenda including anti-Muslim, anti-immigration and white supremacist elements. Their participation, along with the realization of the logistical difficulty of the initiative and the presence of notorious scam artists pushing their own fundraisers under its name, led the industry groups to officially disassociate themselves from the convoy, leaving all the room to the far-right elements. As such, the goal behind the truck convoy is no longer only about pipelines, but also the promotion of a racist, anti-immigrant agenda. Let us seize this occasion to unite the anti-colonial and anti-fascist forces in a mass deployment! Participants in this convoy will be looking to book hotels, truck stops and other accommodation facilities to make the journey possible. We anti-fascists will be doing our best to monitor these plans and intervene when necessary, and we encourage people along the convoy’s route to do so also, and to share information with us. The far-right organizers intend to use the town of Arnprior as a staging ground before the arrival of their caravan to Ottawa. To this end, they have enlisted the support of the Greater Ottawa Trucking Association, with the support of that organization’s ultra-conservative president Ron Barr. The presence of a truck stop right by the Trans-Canadian highway makes Arnprior a strategic location for entering Ottawa from the West. As we get closer to the date and continue to monitor the far-right planning, we encourage all anti-fascists to join actions in support of the Wet’suwet’en people, as well as other anti-colonial struggles. TransCanada’s recent decision to hire RBC to sell its stake in the Coastal GasLink pipeline strongly suggests that the Wet’suwet’en are winning. If pressure can be maintained and increased, CGL may be forced to abandon their plans. Colonialism is the main system breeding fascism on this land, and so any struggle to smash fascism must include a fight to destroy the colonial state and the capitalist corporations in its midst. The YellowVests are not white supremacists nor are they anti immigration. They’re against ILLEGAL immigration and they’re NATIONALISTS. This “counter movement” is a joke and there aren’t that many of you gullible disillusioned folks anyway. Most of what you stand for the YellowVests also stand for so it’s kind of hilarious when we end up converting your own followers. The idea that you can draw a border on the earth, militarize it, and decide who is suitable to live there and who isn’t is a disgusting one. And it’s racist, more or less no matter what criteria are used — whether it’s the open racism of canada pre-1965 or whether it’s the point system currently in place, which uses class as a stand-in for ethnicity and culture, relying on the racist stratification capitalism already carries out around the world. It’s true that opponents of the yellow vests should be more clear that the racism baked into all nationalism isn’t the same as that of the open white supremacists who have also rallied to that movement, but the fact that its less blatant doesn’t make it less present.